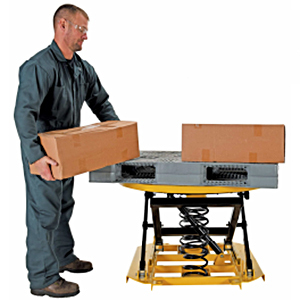 Pallet positioners and spring lift tables are ideal for raising pallets or totes containing goods to an ergonomic work height. Workers will appreciate not having to bend down to build or break down pallet loads. Having positioners of this kind can help reduce work place injuries associated with repetitive bending and lifting. HOF Equipment Company carries a variety of options including spring lift tables, floor level pallet positioners, and U type lift tables. 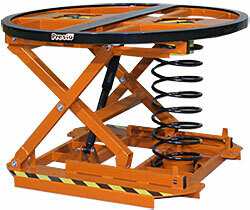 Spring and airbag lift tables are often round and have a rotating deck allowing the pallet or tote to be rotated for improved access. 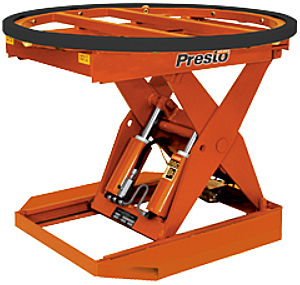 Presto floor level pallet positioners allow for quick and easy loading of pallets with a standard pallet jack due to the jack being able to roll into the lift. 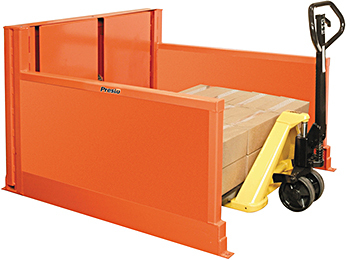 Vestil U Type Lift Tables also provide for simple ground level pallet loading with a pallet jack by allowing the jack’s forks to enter into a cut out opening in the table. 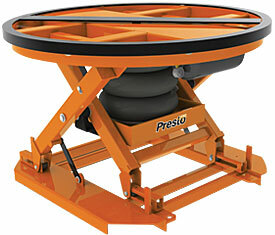 Need help figuring out which pallet positioner you require? HOF Equipment Company has customer service agents standing by to help. Give us a call today at 888.990.1150.